Homeland Security's Future Attribute Screening Technologies (FAST) initiative seems to be gaining ground. 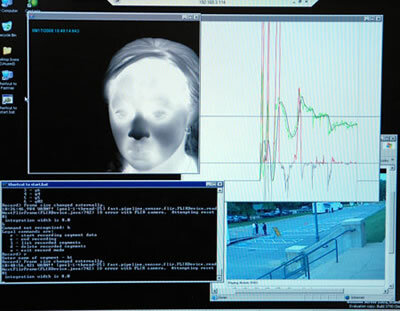 The intent of the program is to develop a fusion of different sensor technologies that would allow operators to detect malicious intent or "hostile thoughts" on the part of people passing through a checkpoint. They're even working on a convenient mobile module. At an equestrian centre in Maryland, 140 paid volunteers walked through a pair of trailers kitted out with a battery of FAST sensors, including cameras, infrared heat sensors and an eyesafe laser radar, called a Bio-Lidar, that measures pulse and breathing rate from a distance. Some subjects were told to act shifty, be evasive, deceptive and hostile. And many were detected. "We're still very early on in this research, but it is looking very promising," says DHS science spokesman John Verrico. "We are running at about 78% accuracy on mal-intent detection, and 80% on deception." Draper Laboratories received a $2.6 million contract from DHS to develop a FAST Mobile Module - FAST M2, the portable precrime detector. Rather than living in giant trailers, it will be an easily deployed unit that can be set up anywhere. "FAST M2, a prototypical mobile suite, will be used for primary screening at security checkpoints, providing a transportable facility for the development, integration and implementation of human centered/behavioral screening technology," DHS says. "While existing screening technologies--such as biometrics--offer the potential to identify known terrorists, FAST technologies focus strictly on real-time psycho physiological/behavioral patterns in an attempt to prevent the unknown terrorist from gaining successful access to his or her desired location. This will be accomplished through the use of mobile, real-time, multi-modal behavioral and physiological sensing technologies that provide culturally neutral indicators of mal-intent." Apparently, DHS will not require bulky analytical wings with babbling precogs to be able to tell, in advance, if you might possibly break the law. From New Scientist; see also the original DHS FAST request for information (pdf), as well as this DHS FAST M2 press release. Thanks to Mike for writing in with the tip on this one.